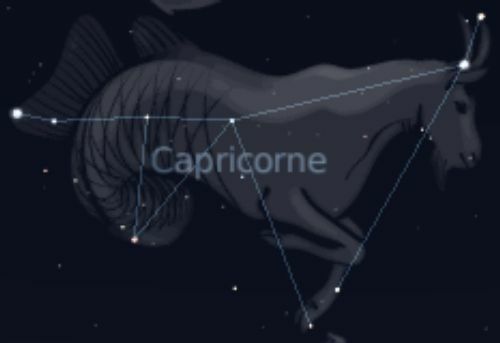 The constellation of Capricorn, from the Latin capricornus, is one of the 13 constellations of the zodiac that the Sun passes through every year. It is between the constellation of Aquarius to its left and Sagittarius to its right. Its principal stars are Delta Capricorni (also called Deneb Algedi) and Dahib. There are five associated meteor showers: the Alpha-capriconids, active from 3 July to 15 August, the Chi capricornids, Sigma capricornids, Tau capricornids and Capricorniden-Sagittariids. In Greek mythology for some people the constellation of Capricorn represented Amalthea, the goat that suckled Zeus during his childhood. To others it represented Pan fleeing from the monster Typhon. After taking the form of a goat he wanted to change into a fish. But on diving into the water, his transformation failed and only his hind quarters became fish. This is why the constellation represents a goat with a fish tail.